It's been a while since I last wrote in, hope all of you are doing great. It's been a rainy couple of days, don't forget to keep warm. Last night I was checking out stuff I missed out from Instagram and my friend Bella was sharing about an Innisfree event at Sunway Pyramid Mall promoting their new foundation product. First you need to create an account at bit.ly/Earninnidollars . It's super fast and easy. Just create an account and play a few games and get your first 500 inf. Here's my 500 inni-dollars (inf) and bank account book. Looks legit right? The next part would be finding your perfect fit. The Innisfree My Foundation have matte (1), semi-matte (2) and glow series (3). After choosing which series you want, then you would need to pick what coverage you like, the selections are from natural (1), medium (3) and full coverage (5). I got 2.3 for My Foundation which is Semi-Matte with Medium Coverage. 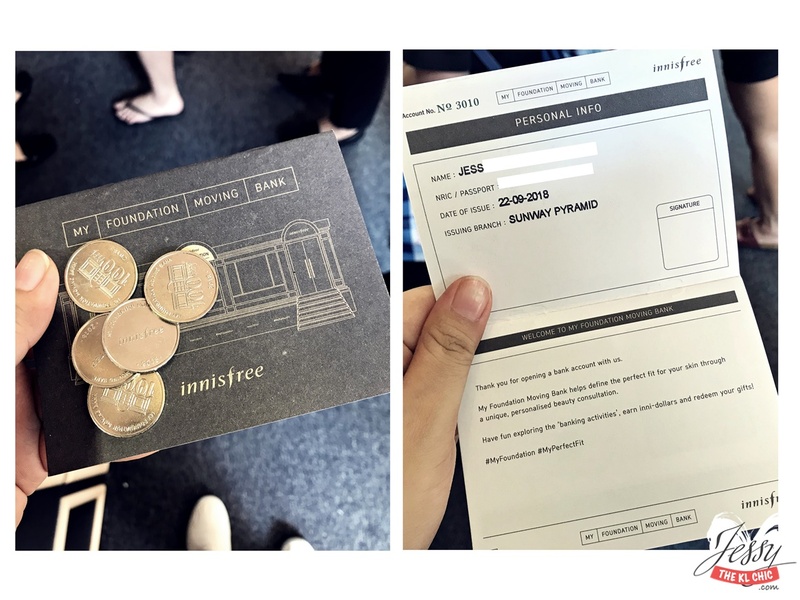 Original price of the Innisfree My Foundation is RM 97. 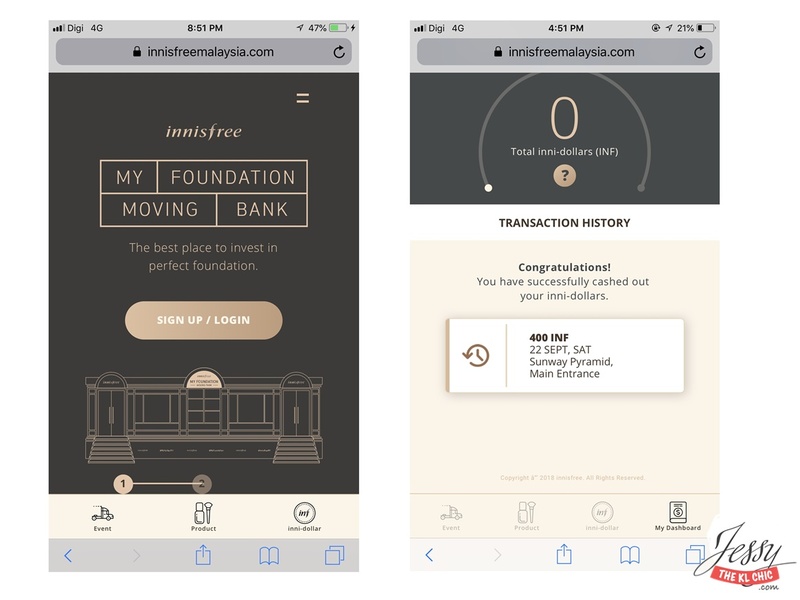 There was a RM 10 voucher given for My Foundation if you are participating in the activity. So I only paid RM 87. Best part is, you get extra 700 inf after purchasing the foundation! One coin was missing from the picture. Here is the best news of all, because I had so many inni-dollars, I got to redeem a brush set! The brush set is 1100 inni-dollars (which is 11 coins). Such a steal! Buy one foundation and get a free brush set! They also had a lucky draw 'Vault' where at a special time of the time, it will be available for those who made purchases. Apparently the prizes are worth RM 200. When I was there, the next vault opening time was after 1 hours and half. Since it was too long, I just left. If it was a trip to Korea, then maybe I would have waited. haha. How the trailer looked on the outside. Very Gatsby feel. I really think that the brush set was the best part of today's purchase. I can't wait to try on Innisfree My Foundation. The texture was very light and watery. Apparent the base is from green tea, so the smell was actually quite nice. I better start wearing make up more often now since I got better tools. haha. This event will still be available at Sunway Pyramid Mall main entrance tomorrow. Don't miss out on getting a free brush set with purchasing Innisfree My Foundation!